Exploring Western North Carolina’s ever-expanding studio glass scene is an education. From blown glass to fused glass and etching, you can encounter a different process in every studio you visit. The dazzling creations you see in and around Asheville are the result of mastery of a number of techniques as well as innovations unique to artist who created them. Want a peek behind the curtain at how the magic happens? Here’s some background on the many ways that local makers fuse, fire, etch, cut and sculpt the work you see in local galleries and studios. Studio glass is a term that’s used to describe glass that’s made by hand with artistic intention. It can be decorative, sculptural or functional; that is, made for use. 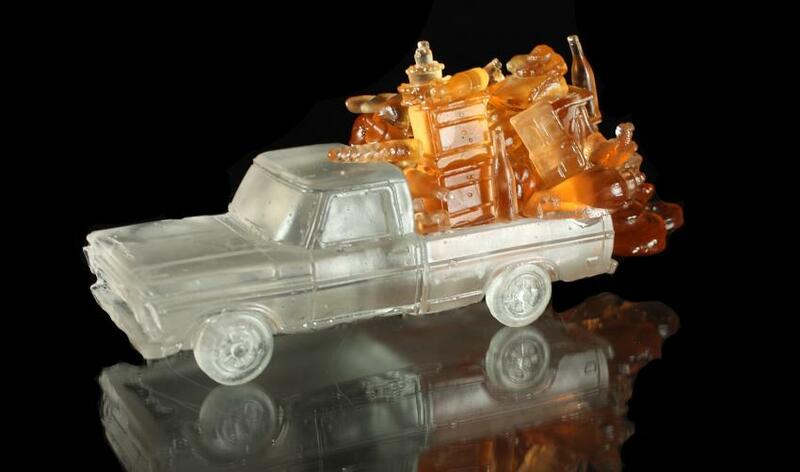 A streamlined, clear decanter such as those made by Spruce Pine’s Terrane Glass serves its function beautifully, while in Asheville, Alex Bernstein’s inventive sculptures (pictured above) are meant to be enjoyed for their artistic merit alone. Studio glass can be made by any of the processes described below. 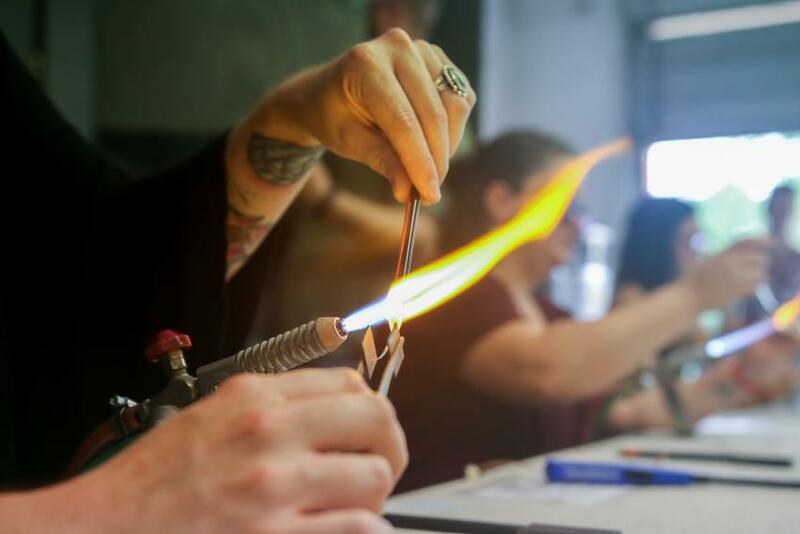 Students practice flamework in a workshop at the North Carolina Glass Center. As the name implies, hot glass includes forms that are made over a direct flame, at temperatures of over 1000 °F. 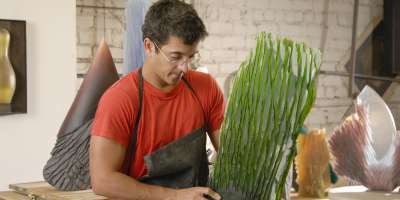 Rods or tubes of glass are heated and shaped by artists while they are still hot. Lampwork or flamework describes a kind of glassmaking that requires a torch, but not a furnace. Blown glass is made with the use of a furnace in which the temperature exceeds 2000 °F. To get a look at Asheville’s hot glass scene, stop by the North Carolina Glass Center, Lexington Glassworks (pictured at right) or Alison Chism Glass in the River Arts District . Head to the Penland area near Spruce Pine and stop in at Toe River Arts Gallery to see work by local artists Greg Fidler, John Geci, Scott Summerfield and more. Cast glass is another hot glass process. It’s made in much the way other cast objects are made: that is, a liquid (molten glass) is poured into a mold, where it hardens, allowing the artist to achieve a sculptural effect. Stop by Blue Spiral 1 gallery for a look at the cast glass work of local artists such as Jan Kransberger, Rick Beck, and John Littleton and Kate Vogel. Or check out the work of national and international artists at the Bender Gallery. "Memento" by glass artist William Austin Norvell, at downtown Asheville&apos;s Bender Gallery. Heat can be used to shape and manipulate glass, but it doesn’t necessarily have to be at the temperatures required for flameworking or glassblowing. Warm glass methods require a kiln, but the artist doesn’t have to be actively working the glass while it’s warm. When making fused glass, the glass doesn’t have to become completely liquid, but just malleable enough to make it stick together. You can see great examples of fused glass at Fyreglass Studios near Spruce Pine (pictured at right). 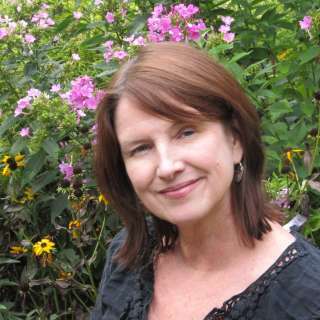 Or stop by Leene’s Glassworks in the River Arts District for functional and decorative fused glass mosaics. Just as it sounds, coldworking describes shaping or applying surface designs to glass without applying heat to the glass itself. Stained glass is probably the best-known coldworking style, achieved by heating the lead or copper foil used to solder pieces of glass together. Another form of coldworking is etching, a process by which surface designs are added to glass after it has been formed. At Selena Glass and Metal Studio in Burnsville, you’ll find glass and multimedia works created with a range of coldworking techniques. At Carl Powell’s studio in the Grovewood Studios next to the Omni Grove Park Inn, you can see the stained, engraved and laminated glass work that’s earned the artist international acclaim. 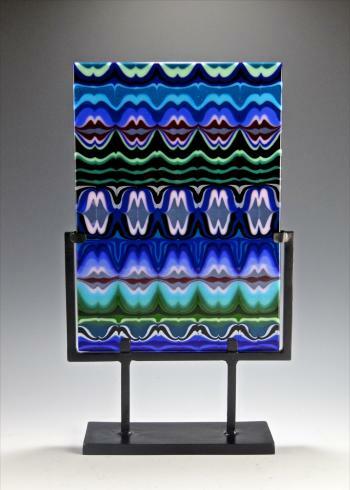 Robert Stephan’s optical glass pieces can be seen at Blue Spiral 1 Gallery. Robert Stephan&apos;s mesmerizing glass spheres and cubes are stunning in motion. 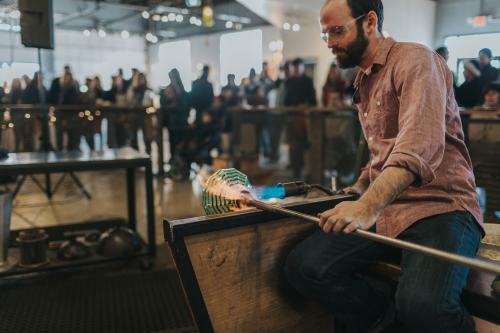 During 2018’s Summer of Glass event, there will be special events every week spotlighting Western North Carolina’s position as a leading studio glass center. Take advantage of this celebration of glassmaking to get a sense of the true scope and scale of what local artists are achieving with glassmaking techniques. Top photo by Sandra Stambaugh; flamework photo by David Huff, courtesy of the North Carolina Glass Center, hot glass photo by Olive & West, courtesy of Lexington Glassworks; William Austin Norvell photo courtesy of Bender Gallery; fused glass by JJ Brown, courtesy of Fyreglas Studio; glass sphere video by Robert Stephan, courtesy of His Glassworks.